This highly effective concentrate cleans hard surface areas of oil and grease with no harm to either concrete or its sealer when used as directed. 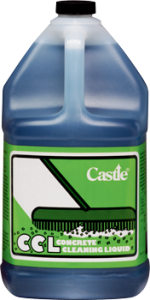 It penetrates and lightens old oil stains with continued use, won’t leave a slick or hazardous floor, and will not harm skin or clothing when used as directed. 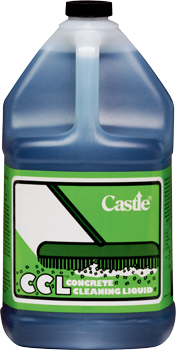 Pleasantly scented, Castle® CCL II™ is water soluble, biodegradable, and non-flammable. It can be used with manual or automatic scrubber. 2. For regular application, dilute 4 ounces of cleaner into 1 gallon of water. 3. Scrub areas with broom or brush. 4. Hose off with water.